The Paynesville Area School District began a roofing project at the high school and the elementary school four weeks ago, replacing roofs that date back to 1982 and 1983. The roofing project is currently set to be completed before classes begin this fall. For the project, $478,000 was budgeted, according to building and grounds supervisor Donnie Mayer. Six sections of roof - 26,000 sq. ft. of the high school, over the choir room and most of the west classrooms and 15,000 sq. ft. of the elementary school, over the media center and most of the southwest classrooms - compose the total project. The high school roof is 24 years old, and the elementary school roof is 23 years old, according to Mayer. "We've got other roofs that are over 20 years old already. We hope to do more in the future." Only about an eighth of the district's roofs are being replaced with this project, said superintendent Todd Burlingame. Some other sections of roofs, not to be replaced in this project, also date to the 1980s. For many years, the district has just patched its roofs, not actually replaced sections of new roofs. "We haven't reroofed in a long, long time, and you can't put bandaids on it forever," said Burlingame. 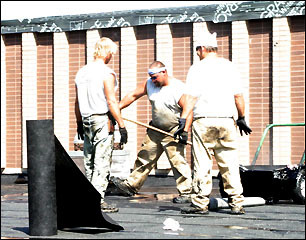 The McDowell Roofing Company works in the sun with tar at temperatures of up to 500 degrees Fahrenheit on Monday afternoon. The roofing project at the high wchool, pictured, and at the elementary school totals 41,000 square feet this summer. The district had wanted to replace another section of roof this summer but could not include it when the bids came back last spring. "Right now, that's all we could afford," said Mayer of the current roofing project. The roof was previously a single layer of rubber, now replaced with thicker layers of tar, paper, and oil, said Mayer. There have been problems between summer and winter due to temperatures and the stretching of rubber, causing many leaks, he added. A drain even needed to be added in science classrooms where water was pooling, he explained. Also, when the roof was opened, wet insulation was found, said Mayer. The new roof being installed is a "built-up roof," added Mayer. Skylights on the elementary school roof are being removed and covered because the areas were cracking and replacing them would be too expensive, said Mayer. Roofing companies are usually busier in the summer, said Mayer, and because of this, it is usually more expensive to have the project done during the summer months. The district bid the project allowing the contractor to work into fall to receive a better bid, saving $40,000. However, due to the dry summer, excellent working conditions for roofing, the contractor should have the project done before fall. If the project is not completed by the beginning of the school year, the contractor expects to continue work outside school hours. To pay for the project, the school district bonded for $440,000 over ten years this spring. The first payment - $12,000 in interest in 2007 - will be paid out of the district's debt reduction fund, which has a surplus. Starting in 2007, the district will utilize a new deferred maintenance levy to make the $58,000 yearly bond payments (for nine years). This is a new levy allowed by the state for districts to use for capital needs. The local school district opted to bond for a larger reroofing project and then repay the bonds with the new levy, which should be included in the district's tax levy next year. With more roof sections dating back to the 1980s and with a number dating back to 1992 (when the middle school was added and the elementary school remodeled), the district will not be able to wait another ten years before doing more roofing projects, according to Burlingame.